Hey Internet friends. Been a lot going on lately, but most of it’s too boring to write about. Like budgeting! After doing our taxes (Okay, Randall did them without my help) we have determined that we should be able to do a full remodel of the bathroom in about one year. Maybe less, but that’s if no emergencies come up in the meantime. By the way, this is Mooncookie. 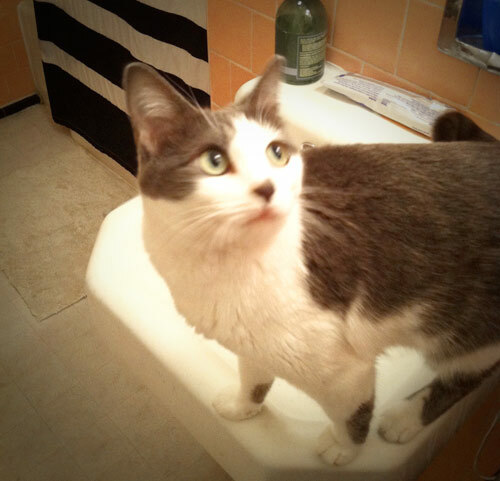 She loves water and the dingy bathroom is her favorite place to be. We may still tear down the kitchen ceiling for fun (that’s “fun”!) if we get bored and curious enough, but if we do it’ll remain open and unsightly until we can fix it up right. Meaning: after the bathroom. In the meantime I can muse a lot on plans and materials. Tiles. Showers. We’ve already been over tubs. Toilets. Vanities. Paint. Lighting. I’ll break down some of those picks soon.